Before you choose your new favorite skis it is important to get the right boots. If you are still in last century’s rear-entrys, your feet only last a few hours skiing, or your boots are getting old and packed out, it is time to upgrade. Boots, like running shoes, break down over miles. After around 100-150 days of skiing, boots pack out and sometimes start falling apart. Modern boots fit better, are customizable and allow for better control of your skis. First, choose a store with reputable, experienced boot fitters. You can find boots cheaply at discount stores, but the salespeople may not know everything you need to know about a boot. Start by talking to your salesperson about boots for specific foot shapes. Some companies like Technica run narrower. Others like Solomon have width options, but don’t always work if you have wide forefoot and a narrow heel. Nordica is better for this foot shape, but your boot fitter should know specific details about the brands they carry and the difference between models within a brand. As always, be honest about your ski ability and style. Smaller is not better. Tight boots cut off circulation and cause frost bit toes, as well as bone spurs on the side of your metatarsals. 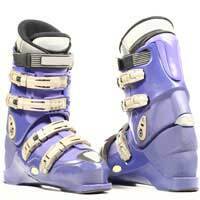 Likewise bigger boots are not good either, as they can affect ski control and create bone spurs on the top of your feet. Once you’ve chosen a few models, your boot fitter should ensure you get the right size. You should have about an inch of space behind your heel with your foot inside the shell and your toes lightly touching the front. Always wear thin ski socks when trying on boots, so you can upgrade to a thicker sock when the boots loosen. For plush boots, brand specific customizable liners, like Technica’s Hot Form liners, or generic foam liners make the boot lighter and offer a more customized fit. Some liners also come with electric plugs to warm them up each time before you put them on. If you’re a fare-weather or beginner skier who never really pushes the envelope, soft forward flexing boots will forgive movement mistakes keeping them from transferring to your skis. Leather boots are nice, as they are softer and can be more comfortable for non-aggressive skiers. Alternately, aggressive or advanced skiers should look at stiffer boots; they want their finer movements transferred seamlessly to their skis. Be sure you can really flex the boot in the store, remember boots stiffen in the cold, and even the best ski won’t carve right if you can’t flex your ankles. If your ankles just don’t flex regardless of the boot’s softness, yoga can help, but look at stiffer boots regardless of your ability level, as they will transmit what little ankle flexion you have directly to the ski boot and therefore the ski, instead of dissipating in the softness of low flex boots. Your boot fitter can help determine the cuff canting that is best for your leg alignment. If the cuff doesn’t match the lower leg shape, the ski will not sit flat on the snow, thus making edging and rotating difficult. Most ski boots accommodate knock-kneed skiers who pronate, so bow-legged skiers should look for boots with a dual cant system; they can be angled both left and right to adjust leg alignment. Once you’ve found a good boot, making finer adjustments may be necessary. Your boot fitter can help you determine the perfect buckle adjustment to alleviate pressure on your instep and thereby numb toes, while maintaining a tighter hold on your leg. Talk to a certified boot fitter about the necessity of orthotic foot-beds. They aid in bone alignment, which translates to better use of edging movements, and keep your feet from becoming tired throughout the day. Not all footbed brands are the same, so talking with a knowledgeable professional who deals with many brands will ensure the correct flex and lift that you need. If there are still painful spots, boot stretching or shell grinding can fix the problem and give an overall firmer fit. Whether the snow is just too good to stay in on a ridiculously cold day, or you have frost bit toes that get cold faster than healthy tissue, boot heaters may be an option. They are easy to install without professional help and run off rechargeable batteries. Beware of burning your feet, as boot warmers can get very hot. Neoprene boot gloves can also help retain heat. With all the finer points of finding the right boots, taking with a certified boot fitter is worth the price. The perfect fit, flex, cant, liner, and orthotic with boot heaters can make the longest day of skiing feel like a jog through heaven.